The oldest temple in the Gulf region is over 7,000. years old. It was discovered by the Polish-Kuwaiti team of archaeologists in Kuwait. This structure is a sensation, because the second oldest temple in this area is a few thousand years younger, the discoverers say. The discovery was made within the prehistoric settlement archaeologists describe as "Bahra 1". Life flourished there at the end of the 6th millennium BC. The site is located in northern Kuwait, in the Al-Subijah desert. There, among the numerous residential buildings in an area stretching for nearly 200 m, the researchers came across a very unusual structure. "It is a rectangular building with a niche symmetrically located in one of the walls. In the niche there are remains of a furnace filled with ashes" - told PAP the head of excavations in Kuwait, Prof. Piotr Bieliński from the Polish Centre of Mediterranean Archaeology, University of Warsaw. 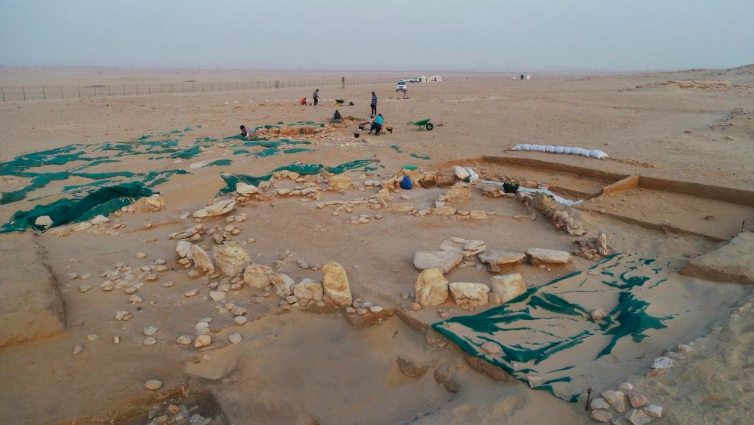 At the end of its existence, the building was surrounded by a circular wall, which - according to the researcher - is a typical solution for places of worship in prehistoric desert communities in this region. "This is the oldest cultic building, the oldest temple discovered so far in the Persian Gulf region" - says Prof. Bieliński. But in his opinion it is an "anomaly", because subsequent buildings of similar purpose are known only from the mid-3rd millennium BC - more than 2,500 years younger. The head of the excavations thinks that the inspiration for its erection came from the area of Mesopotamia along with the influence of the community archaeologists describe as the Ubaid culture. It is believed that this community developed in Mesopotamia but had a global reach, radiating to the neighbouring areas. Its material traces in the form of ceramics and other characteristic objects have been found from Turkey to the Persian Gulf. "The newly discovered temple is very similar to the one already well-known to archaeologists, the temple in Eridu in southern Mesopotamia, which also supports the concept of influence from that region, and validates the concept that the newly discovered building actually was a temple" - says Prof. Bieliński. During the now ending research season, another discovery was made in the vicinity of the building in question. Archaeologists uncovered large fragments of undeveloped space located in the centre of the settlement, surrounded at least on three sides by dense buildings.